From the very beginning, schools and the school system have been at the centre of a major part of CEE's programmes. The journey of school programmes of Centre at the national level started in 1985 through the National Environment Awareness Campaign (NEAC) of the MoEF. 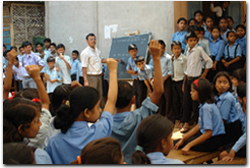 The Centre develops, coordinates and conducts a number of educational programmes for school children, in both formal and non-formal streams of education. To this end, on the one hand, it trains teachers, develops materials for EE, and assists other groups in developing such materials. On the other hand, it endeavours to bring a hands-on, field-based, dimension to school education through opportunities offered by governmental and non-governmental initiatives such as the National Green Corps, eco-clubs, camping, education in and around Protected Areas, etc. CEE initiated the nationwide Paryavaran Mitra programme which aims at creating a large network of environmentally educated students, teachers and whole schools by engaging them in project based learning opportunities associated with EE and ESD. National Green Corps (NGC) – school eco-clubs programme is a national programme conceptualized and initiated by the Ministry of Environment and Forests, Government of India. As the name suggests, it is a programme to sensitize school children about environment, its problems and conservation. Started in the year 2001, the programme is operational across the country through school eco-clubs established for this purpose. Click here for more..